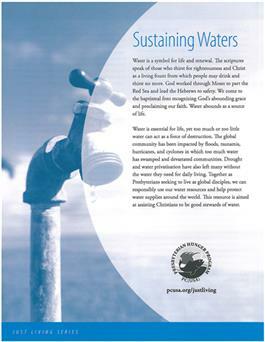 This resource is aimed at assisting Christians to be good stewards of water. As such it highlights three areas: Clean Waters, Abundant Waters and Recovery Waters. Clean Waters covers water stewardship and environmental concerns through protecting and preserving water resources. Abundant Waters focuses on water privatization and the need to maintain public water supplies so that all may have access to safe, abundant water. Recovery Waters explores water related disasters and the people affected by these disasters. Part of the Just Living series from Enough for Everyone and the Presbyterian Hunger Program.